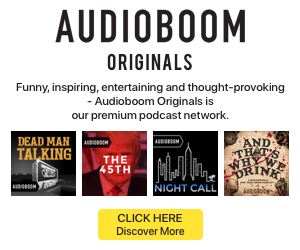 Podtrac has released its March 2019 podcast publisher ranking. It was a month of growth, with seven of the top ten increasing their U.S. unique monthly audience from the previous month. The average U.S. unique monthly audience for this group reached 8.2 million, edging up 1% from February 2019 and up 43% from March 2018. NPR led the pack for yet another month, with its 49 active shows attracting nearly 175.3 million global unique streams and downloads and a U.S. unique monthly audience of almost 18.7 million. Those figures were the largest for the month, with NPR regaining the lead in unique streams and downloads from iHeartRadio, which placed second overall and in the specific metrics. All ten publishers in the ranker were the same from February. 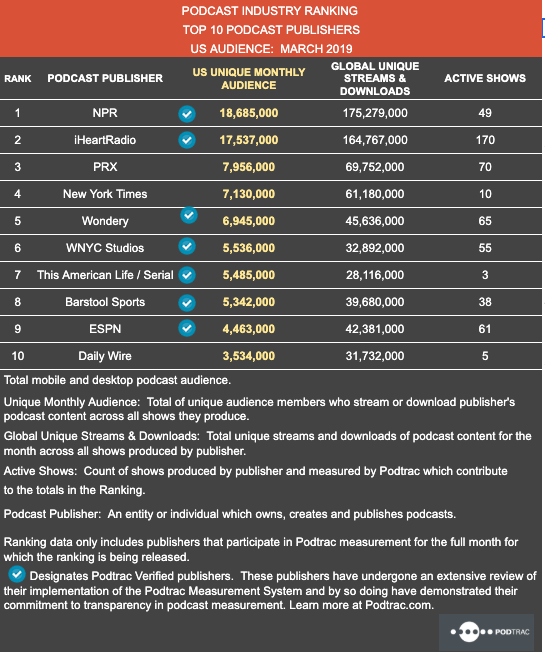 PRX saw the largest increase in U.S. unique monthly audience, growing 14% thanks to its merger with PRI podcasts and taking the third position. WNYC Studios also rose through the ranks from eighth in February to sixth last month.